and growing together in faith. Our congregation includes singles, couples and families brought together by a common desire to praise and celebrate God. Through fellowship, mission, ministry and worship, we nurture our church family, greater community and world, welcoming one another with hospitality, care and compassion. If you are looking for a church home, we welcome you to attend worship with us and consider the possibility of becoming a member of our church. If you have any questions not answered here, please contact our pastor at pastor@flemingtonpres.org or our membership committee at membership@flemingtonpres.org. Visitors and Members of our Congregation are drawn to our church for many reasons. 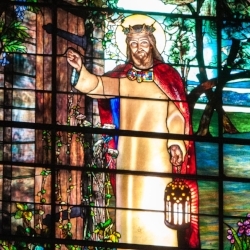 For some, the initial draw is the beauty of the stained glass windows in the 130 year old sanctuary or the joyful noise of our vocal and bell choirs and 100 year old pipe organ. Perhaps the initial experience is an uplifting, meaningful worship service. It might be the priority of our youth programs as exemplified by a weekly children's message during worship and robust Sunday school and Youth Group programs. And for most of us, there's a sense of belonging and a common bond of fellowship and purpose in seeking to do God's will. Why Consider Membership at Flemington Presbyterian? Enlightening worship, great music, pretty windows and a strong youth program are all quality attributes of a church, however, membership in Flemington Presbyterian goes much further. As a Member, one begins to realize the depth and breadth of the church and the love and dedication of its members. Flemington Presbyterian offers a variety of ways to get involved through programs and activities ranging from leadership opportunities in the church Session, serving others with our board of Deacons, participating in numerous outreach programs, youth activities, Christian Education opportunities, Women's/Men's Groups, a Small Group program (interests groups, supper clubs, train clubs, Bible studies, etc.) and much more. There are lots of ways to get involved in the church, and many feel that the more involved, the more enriching and fulfilling the experience and the stronger the bonds of fellowship and purpose. We warmly welcome you to worship and fellowship time afterward to get a better feel for who we are. Introduce yourself, ask lots of questions, and check out the activities happening in our weekly bulletin and at the numerous tables set up during fellowship hour. We hope that you find our church a warmly welcoming community of faith and that our programs and activities meet with your needs in a church home. Our Structure, Organizations, Functions, Leadership, etc. Our gatherings are scheduled on Sundays at 11:00 am, following worship. Childcare is available; just let us know ahead of time. To sign up for our next Inquirers' Gathering, call the church office, see a staff member, stop by the Membership table during fellowship hour, or email the Membership Committee at membership@flemingtonpres.org. Have a conflict with one of the class dates? Let us know by stopping at the Membership table or calling the church office. Please also take a moment to print and complete the Time and Talent form, and bring it with you to class, or return it to the church office by hand or mail. As members of the church, we are called by God to be active participants in the ministry of Jesus Christ, sharing our spiritual gifts, compassion and care with the world to advance the kingdom of God. As you begin or continue in your faith journey, we encourage you to prayerfully discern God's call for you and how FPC might be a part of that faith journey.